Four Foundations For The Girl That Can't Decide.. I don't know about anyone else, but when it comes to makeup, I can never just stick to one product all the time. I do have my holy grail favourites, but I go through phases of changing what I use everyday. 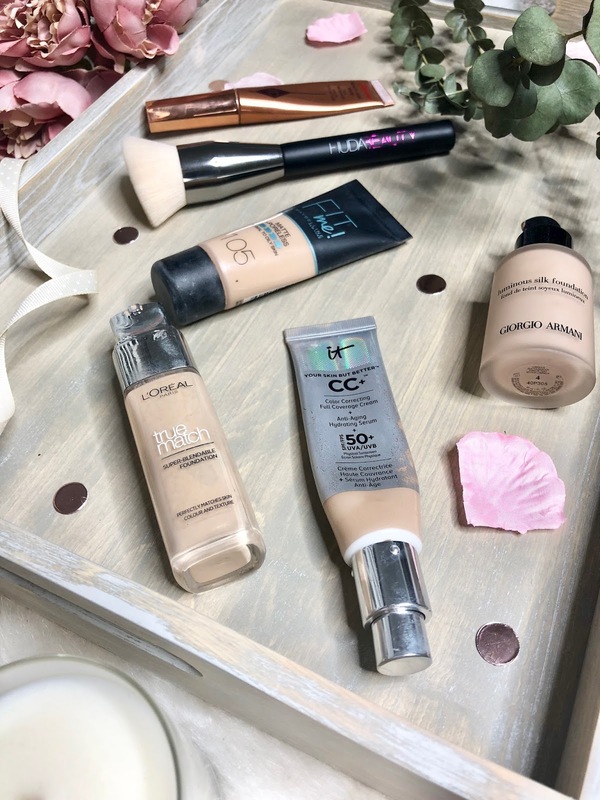 I've picked out four foundations that seem to be the main ones I go back to in a bid to find out which is my number one fave. This is one of those products that was so hyped up in the beauty world that I almost never bought it purely out of stubornness and not wanting to follow the latest craze. 3 months on from giving in and I've barely used anything else since. You can clearly see how well loved it is from the state of the packaging now ha! It feels like a moisturiser when you apply it because the texture is quite thick but really creamy. I love that it is anti- ageing and really hydrating on the skin, but it doesn't feel heavy at all. I usually use the Spectrum B01 brush but I've recently bought the Huda Beauty Buff/Blend brush so I'll be giving that a whirl this week. I would say the CC cream needs buffing in slightly more than some of my other foundations but it literally lasts me all day, even when Rosie is grabbing my face all the time. I would give this foundation a strong 9/10, it's a hard one to beat! This is my favourite 'throw it on quick while Rosie naps' foundation. It gives full coverage and lasts quite a long time with the right setting powder. I apply it with a brush and then blend it in with a damp Beauty Blender. The finish is lovely and for a tenner this foundation gives higher end brands a run for their money. I would definitely give this an 8/10 my only issue with it is I find it moves around on my skin if I don't set it well enough. My Mum got me this foundation for Christmas after I'd been going on about it for months. 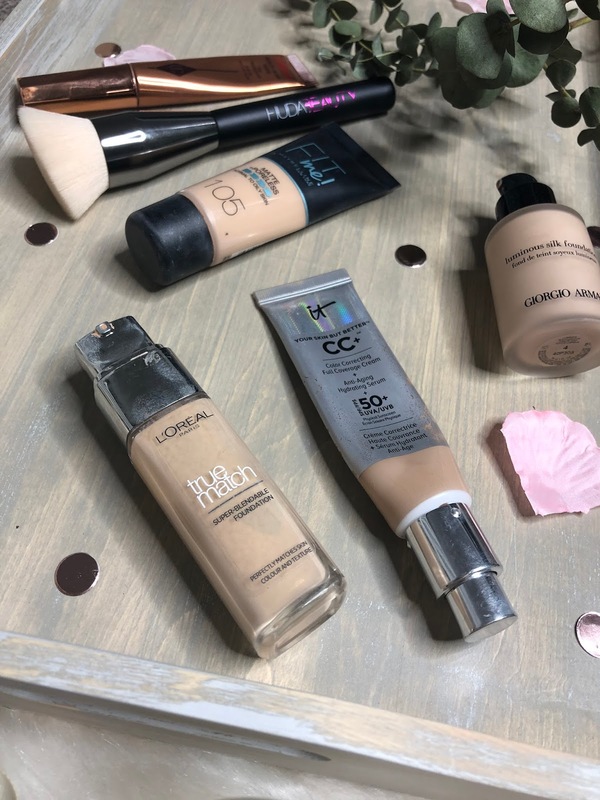 It's one of those foundations that I don't think I could justify having as my everyday one purely because it's expensive and I feel like I use quite a lot with each application. I've been trying to save it for days were I'm actually going somewhere nice and not just to the park etc. It's quite a runny consistency even for a liquid foundation, but the finish is full and airbrushed which I love. I would give this 8/10 but only because it seems to crease around my eyes after a few hours, making me look like I have wrinkly eyes which is never good ha. I originally only bought this because it was on sale on Asos for less than £5, but I ended up repurchasing because I really liked it. The coverage is medium- full depending on how much you apply but it's really easy to build up without it looking cakey. When I wear this I always moisturise my skin and prime it because I feel like it seperates on my skin if it's too dry. I would probably give this 7/10 for that reason but for the price of it I really can't complain! This is my little army of bases, I will add that I absolutely love Nars Sheer Glow and Luminous Weightless but I've ran out of both. I did used to use Mac Studio Fix every single day but if I did have to choose I'd have to say my go-to now is always the It Cosmetics CC cream because it's just bloody delightful. Let me know if you recommend trying any other foundations as you can see I'm always up for trying new ones! I've always wanted to try the Giorgio Armani foundation but wimped out when it comes to the price! 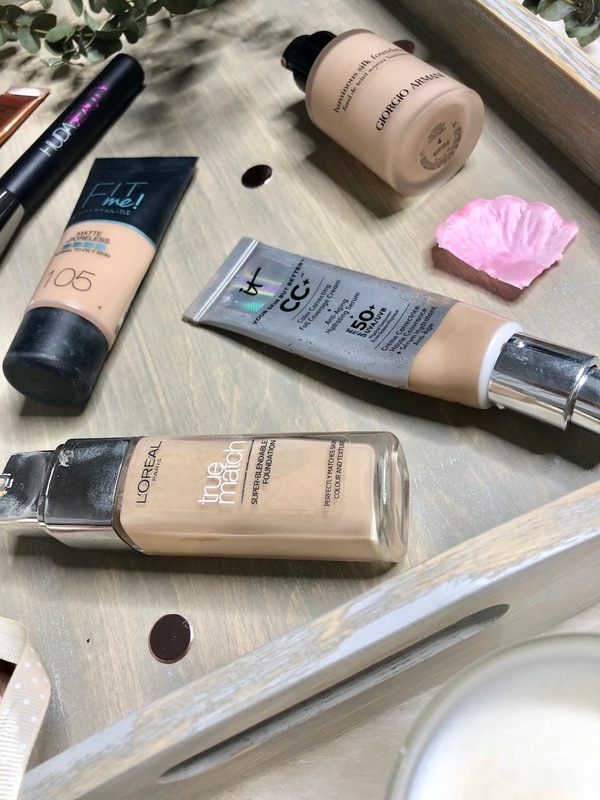 I've fallen in love with a Revlon foundation at the moment because it works amazing on my skin, it really does show that drugstore brands are hitting the mark the same as high end brands now though! I'd love to give any of these foundations a twirl they sound great! I'd love to try a few of these foundations! I currently only have a nearly empty bottle of Revlon ColourStay, so I might have to purchase one of these to try. I have two of the four and I love them. I wish the Armani one would work for me but it just doesn’t. The Armani foundation is absolutely incredible! I love it!